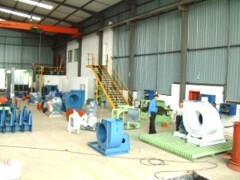 The Company was established in 1965 as a manufacturing contractor in the air conditioning and ventilation industry. Over ensuing years, manufacturing operations predominated and contracting eventually ceased. Since 1994, we have been rationalising and developing our product range to focus on the needs of the industrial fan market. This led to the development of our range of TROJAN fans. To continually innovate, using current technology, to improve the service and products that we offer. To be a dependable supplier in all respects leading to our TROJAN Fan slogan : "Focused on Dependability"
Our premises are situated in Aeroport, five minutes from OR Tambo International Airport. 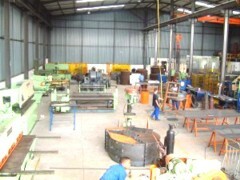 The premises include a modern factory with an area of 1200m², as well as 400m² of office space. In addition we have a full in-house design facility, enabling us to offer purpose designed equipment for the widest range of specialist applications, as an extension to our standard product range. We are also geared to providing customers with application based engineering information in the shortest possible time.